Dr. Ann Oberhauser is director of Women’s and Gender Studies and professor of sociology at Iowa State University. Her research focuses on feminist economic geography, gender and globalization, and critical development studies with an emphasis on rural economic strategies in Appalachia, sub-Saharan Africa, and more recently Iowa. She holds a PhD in Geography from Clark University and, before moving to Ames, Iowa, was professor in the Department of Geology and Geography at West Virginia University. Her co-authored book, Feminist Spaces: Gender and Geography in a Global Context, was recently published by Routledge in 2017. She also co-edited a book with Ibipo Johnston-Anumonwo, Global Perspectives on Gender and Space, in 2014. 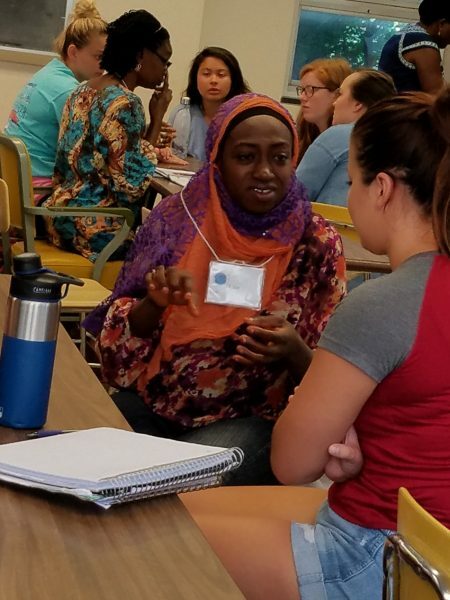 Discussion during a WS class[/caption] Oberhauser's scholarship draws heavily from feminist qualitative research and fieldwork that engages with community-based networks and women’s roles in rural development in the global South and global North. She has also engaged with critical pedagogy in her teaching and research. This scholarship and praxis explores the effectiveness of experiential learning or Global Service Learning (GSL) in programs she has led to Tanzania. Oberhauser has also been involved in a multi-disciplinary project on the use of social media among college students with colleagues in psychology and communication studies. This research analyzes how computer-mediated communication (CMT) impacts students’ attachment to family and friends. Her teaching specialties include feminist theory and research, gender and globalization, development studies, and gender and work. These graduate and undergraduate courses are offered in the Department of Sociology and Department of Women’s and Gender Studies at Iowa State. Dr. Oberhauser is a member of the International Geographical Union Commission on Gender and currently serves as the treasurer of this organization. She is also active in the Geographic Perspectives on Women Specialty Group of the American Association of Geographers. At Iowa State University, Oberhauser serves on several committees including the University Committee on Women, the Women’s Leadership Consortium, and the Committee on Diversity and Inclusion in the College of Liberal Arts and Sciences. Oberhauser, Ann M. and Martina Angela Caretta (in press) “Mentoring for Early Career Women Geographers in the Neoliberal Academy: Dialogue, Reflexivity, and Ethics of Care” Geografiska Annaler: Series B, Human Geography. Oberhauser, Ann M., Dan Krier, and Abdi Kusow (in press) “Political Moderation and Polarization in the Heartland: Economics, Rurality, and Social Identity in the 2016 U. S. Presidential Election.” The Sociological Quarterly. Oberhauser, Ann M., Jennifer Fluri, Risa Whitson, and Sharlene Mollett (2017) Feminist Spaces: Gender and Geography in a Global Context. New York: Routledge. www.routledge.com/9781138924536 . Oberhauser, Ann M. and Rita Daniels (2017) “Unpacking Global Service-Learning in developing contexts: A case study from rural Tanzania” Journal of Higher Education Outreach and Engagement 21(4):139-170. http://openjournals.libs.uga.edu/index.php/jheoe/article/view/1923 . Oberhauser, Ann M. (2016) “Gender and Development,” The International Encyclopedia of Geography: People, the Earth, Environment, and Technology. Wiley Publishers–AAG. Aladuwaka, Seela and Ann M. Oberhauser (2014) “’Out of the kitchen’: Gender, empowerment and microfinance programs in Sri Lanka.” In Ibipo Johnston-Anumonwo and Ann M. Oberhauser (eds.) Global Perspectives on Gender and Space: Engaging Feminism and Development, pp. 35-52, London: Routledge.